Charlotte and Esme Campbell were born at 26 weeks. Sadly, Esme died shortly after this photo was taken. Picture: Caters. 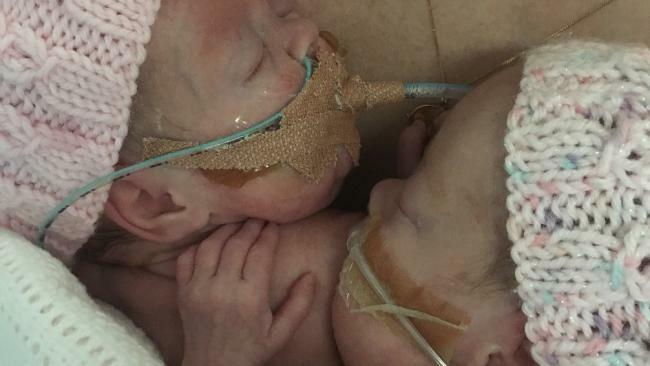 A MUM has shared a heartwarming photo of her premature baby's 'goodbye hug' for her dying twin sister - just days before she passed away. 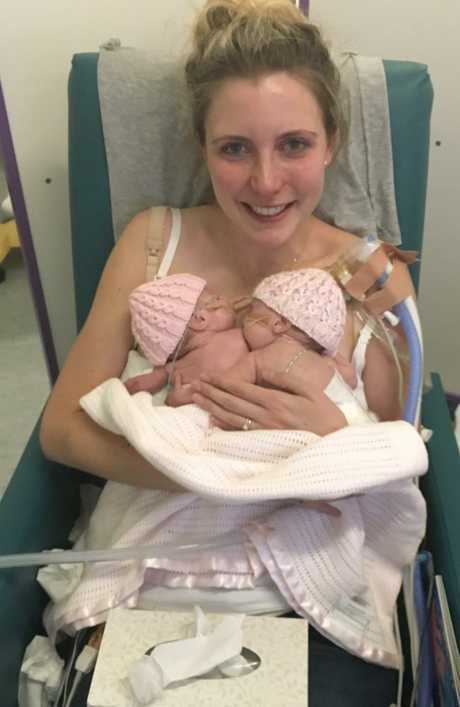 In the touching picture of the first time Amy Campbell got to hold both her daughters together, tiny Charlotte can be seen wrapping her arm around her sick twin Esme. Just moments earlier former special needs teacher Amy, 30, and her husband Conor, a 32-year-old commercial manager, had received the devastating news that Esme had an extreme amount of fluid on her brain. Esme had spent seven weeks battling for survival with her sister Charlotte since they were born severely premature at 26 weeks and five days on July 10, 2016 - weighing just 990 grams and 900 grams respectively. 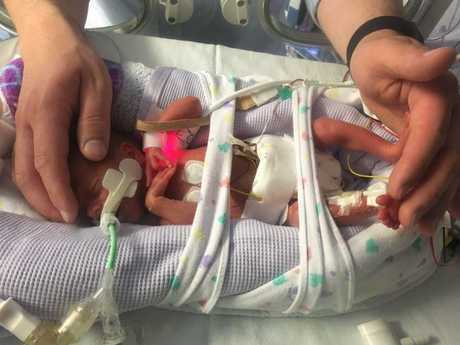 But after tests revealed that the ventricles in Esme's brain had filled with so much fluid that she would never have any quality of life, Amy and Conor made the heartbreaking decision to switch off their baby girl's life support. Determined for their daughters to 'meet' before Esme passed away, first-time parents Amy and Conor from Leeds in northern England, asked for the nurses to help them hold the girls at the same time. As nurses lay the twins on their mum's chest, Charlotte placed her arm around her sister's shoulders - a precious memory Amy said 'felt so right'. 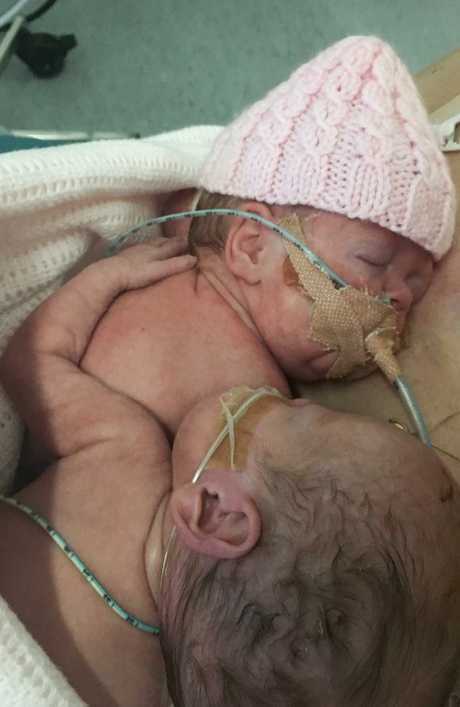 Tiny Charlotte Campbell can be seen wrapping her arm around her sick twin Esme. It was the first time the girls had ‘met’, and just days before Esme died. Picture: Caters. The emotional photo of the twins' embrace was taken on August 27, 2016 and Esme died in the early hours of August 30, 2016. Full-time mum Amy, who is now 38 weeks pregnant with a baby boy, said: "Esme had had a really bad infection but on the Friday we got told that her infection markers had come right down and we thought she was fighting back. "Then on Saturday I was out walking the dog and I got a phone call from the hospital. They never called unless there was an emergency so I knew something was really wrong. "They told me they thought we should come into the hospital, I just knew they were going to tell us that Esme was dying. I collapsed in the field and a man from the village had to come and get me to my feet. "I called Conor and we drove to the hospital, it was such a horrible drive. The whole time I knew I was on the way to face hearing that Esme was too poorly. "The doctors told us that more fluid had gone into her ventricles in her brain and her head circumference had increased so much that even if she were to survive she would have absolutely no quality of life. "Before having the girls I had heard a mother who had lost her baby cry at her funeral. Her cries went straight to my bones. "I remember thinking 'I hope I never have to hear them again'. Then suddenly I was hearing them coming from me. "We knew we didn't want Esme to suffer but how do you decide when to switch off your baby's life support? It was a massive decision. Both girls were tiny when they were born, and Esme was actually stronger at birth, but got an infection after a few weeks, which lead to too much fluid on her brain. Picture: Caters. "How will you know when to end your child's life? All I did know was that before she died I wanted them to meet one another. "Conor and I had never been able to hold them both at the same time so the nurses arranged to help us out. They were really brilliant the whole way through. "The nurses placed them on my chest and Charlotte put her arm around Esme and I thought 'they love each other'. "It was probably Charlotte just getting comfortable but it would be beautiful to think she was giving her sister a big cuddle. She is such a caring girl that maybe she was hugging her. "That moment of having them both snuggled up in my arms was the best moment of my life. Despite the devastation of what we had just been told, in that moment everything felt so right." After a late evening spent holding their girls, Amy and Conor arranged a christening for Charlotte and Esme on the ward at Leeds General Infirmary on Sunday August 28, 2016. Still distraught at the thought of having to decide when to turn off her baby's life support, Amy spent that night sat by Esme's incubator chatting to her 'shining star', her 'tiny dancer' - and writing about her baby. The parents knew the next day it was the right time to put an end to their daughter's suffering and Amy and Conor held their brave girl for 12 hours after her life support was turned off until she died in her mother's arms. Mum Amy was devastated by the news that Esme was unlikely to live, but she wanted to give the girls a chance to ‘meet’ before she died. Picture: Caters. Esme was buried in Charlotte's christening outfit on September 13, 2016 and Amy planned a celebration of her life in a hall decked out with bunting and photos of their last day together taken by the charity Remember My Baby. Amy said: "The christening was beautiful, all our family and close friends were there. "The church was so full that people were having to stand at the back. It felt very special. It made us feel very loved - and that Esme was very loved. "I didn't know how I was going to cope but I've found that the times I have feared the most are now the times I have the most treasured memories of. "We were going to switch off Esme's life support after the christening but we couldn't do it. It was such a lovely day and we didn't want to remember saying goodbye to her on her christening day. "We decided to wait until the next day. By this point she was having really regular seizures and we knew that there was no benefit to prolonging her suffering. "That night I couldn't sleep so I went down to see Esme. I sat by her incubator and asked the nurse for a pen and paper. "I just started to write about her. We always said she would be a dancer or love yoga because she was so relaxed and her little feet were always on the go. "It felt so good to write it all down and capture everything special about her. It also felt like such nice time to have with just the two of us. "The next day Conor and I knew we were ready, Conor carried her down to the family room. It is so hard to think about that moment but I knew I had to do it, I had to do it for Esme. "She stayed with us for 12 hours after the life support was turned off. It's like she needed it to be on her terms, she would decide when she was going to go. "I was holding her when she took her last breath. When she died and we realised she wasn't coming back it was so heartbreaking. Amy Campbell was devastated when she was told her daughter wouldn’t survive, but determined to give the girls a chance to spend time together before Esme died. Picture: Caters. "But I tried not cry because I wanted her to be surrounded by happiness and love and strength. I wanted her to remember that she had a strong mum and she shouldn't be scared of where she was going next. "I called the piece of writing I did with Esme 'My Bright Shining Star' because that is what she had always been since finding out that we were going to have to say goodbye to her. "And that night when Conor and I got home this shooting star went across the sky and we knew it was her. "I think she wanted us to know that she was happy and loved and it made us understand that we really had done the right thing. It was truly beautiful." 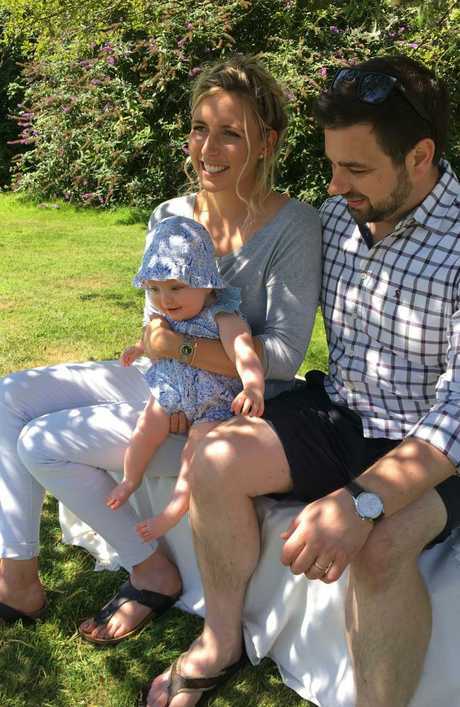 Conor and Amy, who met 12 years ago on the rowing team at Northumbria University, were over the moon when they found out they were expecting a baby in February 2016. And at 11 weeks after suffering a bleed, an ultrasound revealed that Amy was expecting twins - much to the couple's shock and delight. At 24 weeks and three days pregnant Amy was rushed to hospital again as she had gone into early labour and her waters for Charlotte had broken. 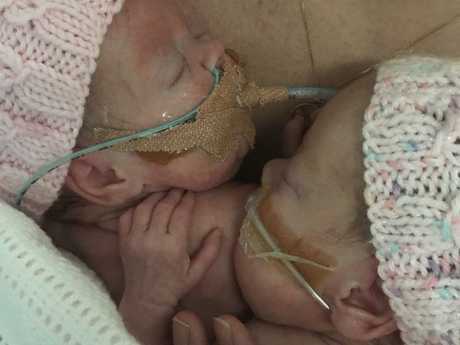 The non-identical twins had separate placentas and amniotic sacs but over the next 17 days, while mum remained on bed rest in Leeds General Infirmary, Esme shared her waters with her sister. Charlotte, now 22 months, came home with her mum and dad on the twins' due date of October 10, 2016 and has been thriving ever since. Charlotte Campbell is now doing well and will soon be a big sister, as Amy and Conor are expecting a baby boy. Picture: Caters. Amy feels that the girls have had a magical bond since before they were born and that Esme will always be there for Charlotte in that special twin way. Amy said: "When Charlotte lost her waters I was terrified and not sure what was going to happen next but they managed to hold on for another 17 days. "When the nurse told us that Esme was sharing her waters with her sister, it was incredible to know the girls were working together. I felt very proud of them. "After they were born Charlotte was so poorly. They really struggled to intubate her and we were told that each hour was crucial. "Esme was always the stronger one but at about six weeks our week of hell started. They found out she had fluid in her ventricles and no matter how hard she fought it kept getting worse. "In her short life she taught us nothing but courage and bravery. She taught us what love means in its purest form and the best ways to live our lives. I think she has always looked out for her sister. "Charlotte and her baby brother will always know about their sister Esme. We keep reminders of her all around our home to allow it to happen naturally." Since losing Esme, Conor and Amy have set up a non-profit organisation in her memory called Campbellinas - their nickname for the twins. 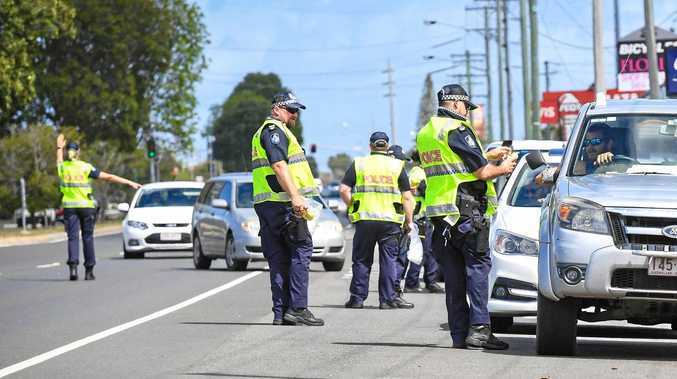 The couple have raise more than £10,000 ($AU17,673) so far as a way of giving something back and saying 'thank you' for all the support they received from the Leeds hospital. Amy has also set up a blog called This Is My Brave Face to help other families coping with the loss of a child. To donate to Campbellinas click here.